Greetings from Missoula, Montana, where the temperature is hovering around 20 degrees! I’m not sure what the weather is like around the rest of the country, but I’ve been drinking my fair share of warm beverages. We are spending Thanksgiving with Jeff’s family in Missoula. The city got some early snow this year, so it’s absolutely picturesque here–complete with pristine, snow-covered mountains and fragrant pine trees. It’s the one time of the year when I can shamelessly rock my leggings tucked into Sorels. Don’t judge. 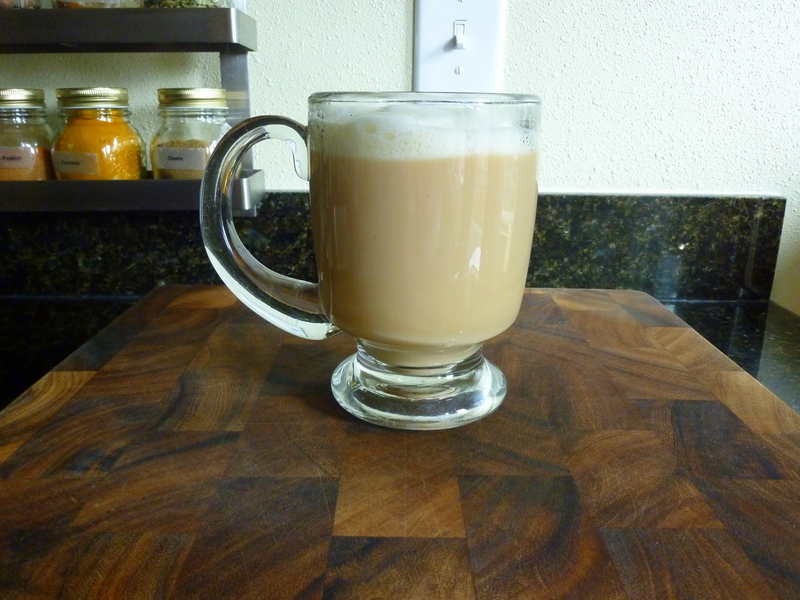 Before we left, I spent some time perfecting my Earl Grey latte aka London Fog. I had my first London Fog last year at Starbucks and I just loved the concept: Earl Grey tea with a hint of vanilla and sugar, topped with a bit of foamy milk. The tea is the straight forward part. Brew either loose-leaf of bagged Earl Grey as you normally would. Only for this drink, double the amount of tea bags or leaves you would usually use. Be sure to follow the directed steeping time though, because the tea will get bitter if it is allowed to sit too long. (I learned from experience) The trickier part is the vanilla syrup and frothy milk. Sadly, my $1.99 Ikea handheld frother bit the dust a couple weeks ago (shocker!). While I was researching alternative frothing methods, I happened upon a post from The Kitchn about microwave-frothed milk. I was skeptical at first, but it really works! You basically take a jar and fill it with fresh milk. Cover the jar and shake it like a maniac for about 30-40 seconds until the milk is foamy and doubled in size. 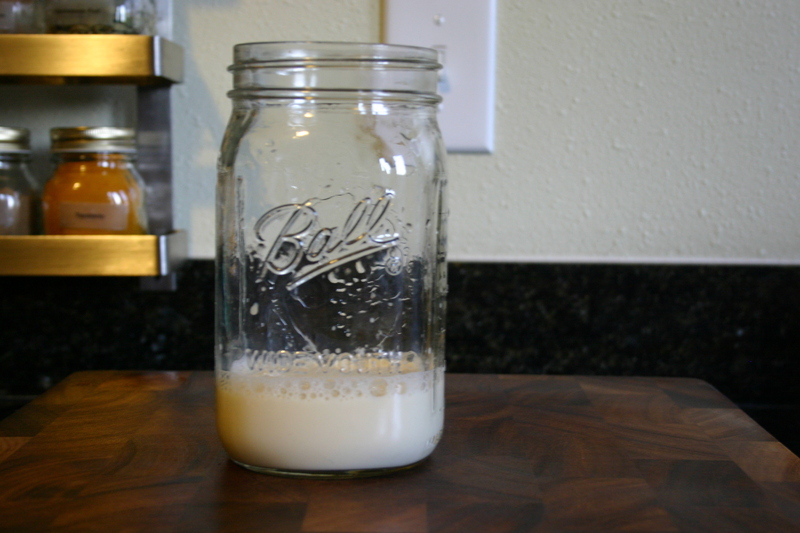 Take off the top of the jar and microwave the milk for about 40-45 seconds. 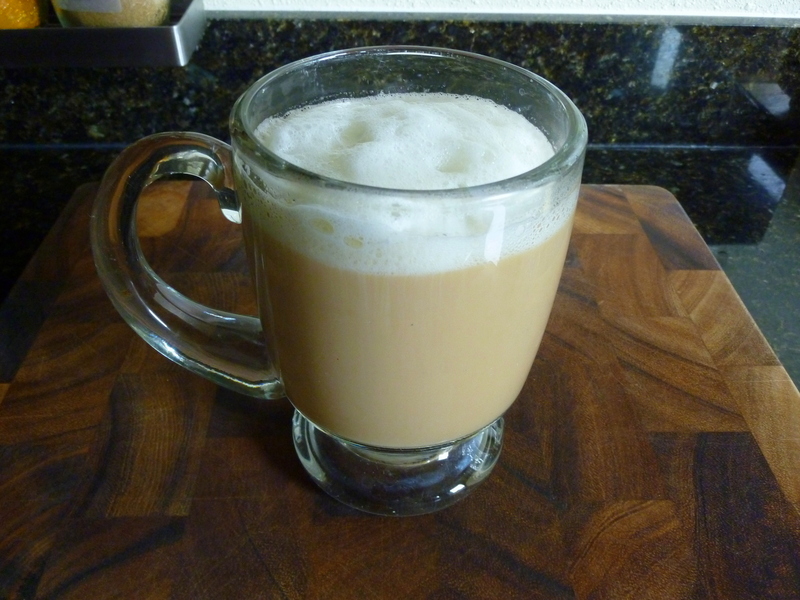 The heat of the microwave stabilizes the foamy milk and makes an awesome accompaniment to tea or coffee drinks. I’ve tried this with all kinds of milk–whole milk, 2% milk, nonfat milk, soy milk. The trick is using very fresh milk. The older it is, the less frothy it will get. Interestingly enough, I have actually had great results with the kind of soy milk that you buy in cartons. I speculate that this is because the milk is not exposed to air until I open it up at home. In contrast, some of the milk you buy in the refrigerated section of the supermarket has been sitting around for weeks exposed to air. Maybe that makes sense…maybe it doesn’t. But that’s my theory and I’m sticking to it. This method will not give you the most frothy, sweet foam that you can find at the coffee house, but it is just enough to give your morning routine a little extra pizazz. Be sure to use a large jar because the milk will expand a lot while being heated in the microwave, and then deflate as it cools. I recommend you play around with different brands, percentages, and types of milk to find the one that works the best for you. I messed around with a few different sweetening options, but I found a vanilla simple syrup worked the best for this recipe. You can certainly use store-bought syrup if you are in a time crunch. My recipe is a simple mixture of sugar, brown sugar, water, and vanilla bean. I think two tablespoons of syrup per serving is a good starting place. I use a little under that amount because I like my lattes less sweet, but you can adjust to your tastes. Using a real vanilla bean in a simple syrup may seem a little extravagant, but nothing goes to waste. After scrapping the seeds out of the bean, I dry it off and bury it in a small canister of sugar. After a couple weeks, the vanilla sugar will taste great in cookie recipes, coffee, whipped cream, and more. 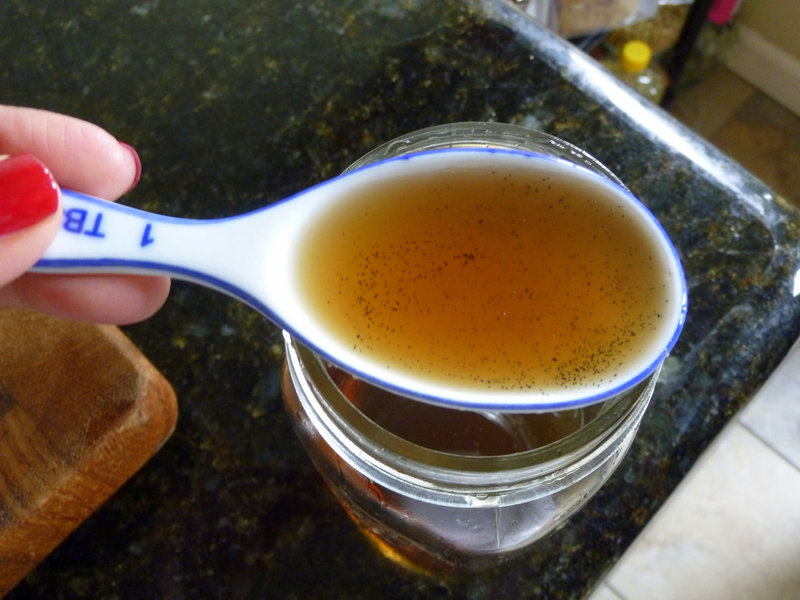 Pour the vanilla simple syrup into a mug and set mug aside. 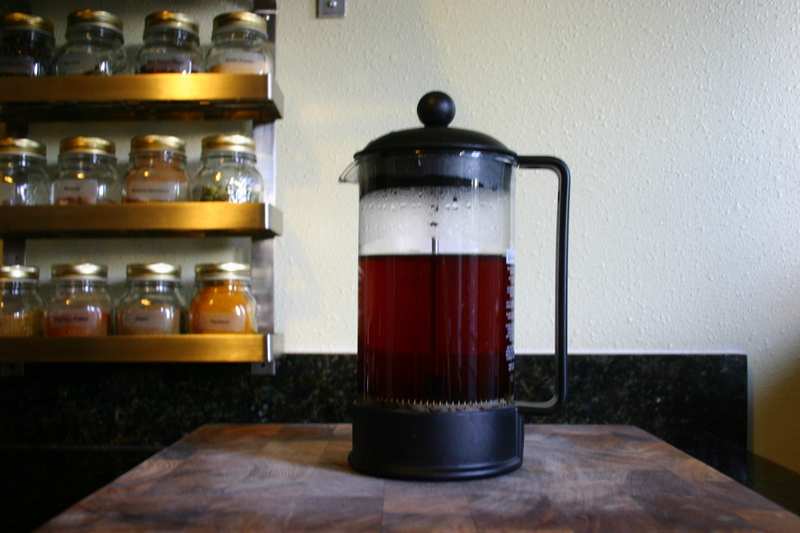 Brew Earl Grey tea using double the amount of tea you would usually use. Steep for the recommended time on package. 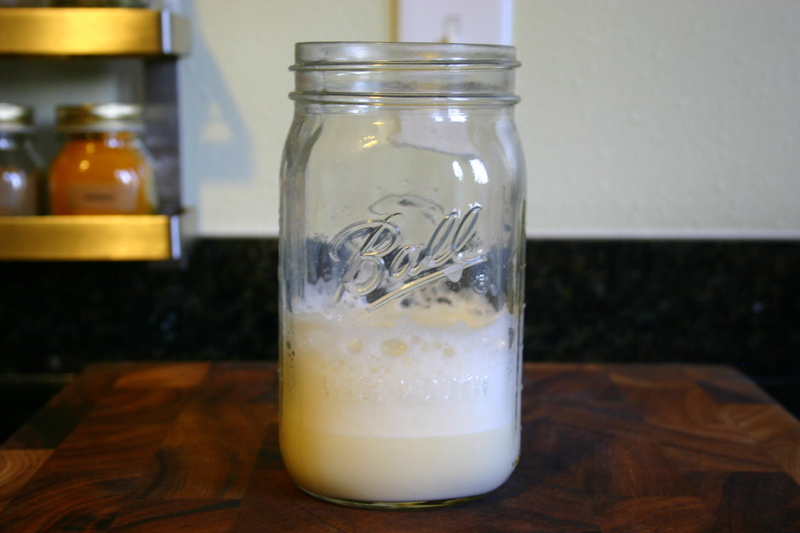 While tea is steeping, pour milk into a microwave-proof jar. Cover, and shake vigorously until the milk is frothy and doubled in size, about 30-40 seconds. Remove the cap from the jar and heat the milk in the microwave for 35-40 seconds. Pour tea into the mug and mix until the simple syrup is incorporated. Using a spoon to hold back the foam in the jar, pour the milk into the mug. Top the latte with the remaining foam from the jar. With a sharp knife, split vanilla bean in half so that the beans are exposed. In a small sauce pan add the sugar, brown sugar, water, and vanilla bean over medium heat, stirring occasionally. Once the mixture comes to gentle boil, turn the heat down to medium-low. Gently simmer the mixture until the it reduces by about half, stirring occasionally, about 10-15 minutes. Allow mixture to cool completely. Fish out vanilla bean, scrape out the remaining seeds with the back of a knife, and add to the simple syrup.